A lot of people have asked me if I am doing a show garden this year at Malvern, and after all the hard work and success of last year, I am a little relieved to say that I am only doing a small stand for a charity. If I tell you the story you’ll see the link with growing exotic vegetables! I was approached by a charity called Plan UK, which encourages people in the UK to sponsor a child in the developing world through its child sponsorship and education programme. It’s a great idea because you have a real link with the individual child and write to them, so over a period of ten years or so you really get to understand your sponsored child’s life and circumstances – it’s great getting the letters back too. Plan UK wanted a stand that shows all the areas of the world they work in, and as the show is for a gardening audience I came up with the idea of exhibiting the types of vegetables grown in the countries the charity works in. This meant I set myself the challenging task of finding out about, and potentially having to grow, some exotic vegetables from Africa and Asia – something I confess I know almost nothing about. It proved more difficult than I had originally thought to find out where I could get the seeds and instructions on how to grow these vegetables in our climate. That was, until I came across a fantastic project based in the Midlands which saves and catalogues all the unusual, exotic seeds and growing techniques from allotments across the area – so the ideal people to talk to about my Plan UK stand. The project is called “Sowing New Seeds” and it is a three-year research project based at Garden Organic near Coventry. The whole aim of the project is to collect exotic seeds from the vegetable plants grown in these allotments and also collect the wealth of knowledge from the people who grow them. This information is then available through a database and the seeds through the heritage seed library at Garden Organic. Many of the vegetables I had never seen before and like any newcomer I was also keen to have the information on how to best to grow the plants. The main issue with a lot of these seeds is the light levels available here, as the plants originally grow in Africa, Asia or the Caribbean where they have much longer daylight hours than we do in Northern Europe – so finding the best varieties that have adapted to our lower light levels has been crucial for the project’s success. Some of the allotment gardeners have been growing these vegetables in Birmingham for fifty years and if the information isn’t catalogued and the seed collected, it could die out with them. 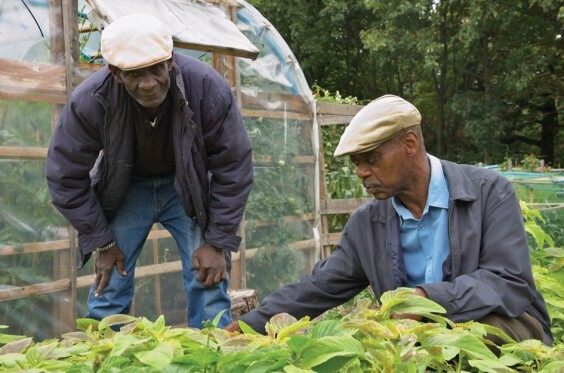 This includes people like Vincent, who came over from the Caribbean in 1977 and has had an allotment ever since. One of the people who heads up the project is Anton, and I went to meet him at Garden Organic where they are also building a display garden to show the vegetables they have collected and learnt about. They all have a great enthusiasm for the information they have collected but mainly for the amazing characters they have met. Anton gave me some seed to try for my Plan UK stand; this seed cannot be sold as it is not commercially registered which is why they have teamed up with the heritage seed library and can give it away to members to try growing (details at the end of the article). Armed with my seed I headed home and back to my friends John and Wendy, who grew all the fabulous vegetables for my show garden last year. They now have the seed germinating in their nursery and, through the Sowing New Seeds website, they have access to all the instructions they need to grow these amazing plants. I’ll be popping in regularly to see how they are getting on. My job is then to get our stand built and I’ll be planting it up for the Malvern show which opens on May 11. Do pop and say hello if you are at the show this year and see how we got on with the exotic vegetable growing. For more information on Sowing New Seeds, visit http://www.sowingnewseeds.org.uk or go and see their display garden at Garden Organic (http://www.gardenorganic.org.uk), which also has all the information about the heritage seed library and how to get the collected seed.